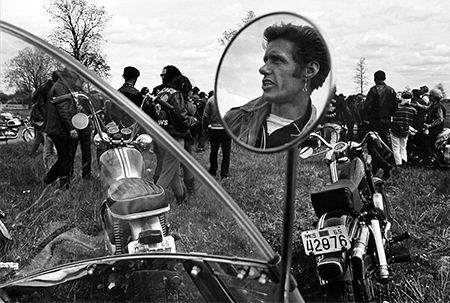 Danny Lyon shuns objective distance from the subjects of his narrative photographs. He immerses himself in the settings he’s chosen to document. Coming on the heels of Lyon’s 2016 retrospective at the Whitney Museum of American Art, this exhibition is a generous tribute to three important series from the 1960s and ‘70s, as well as selections from later projects. Most of the more than 60 photos are vintage gelatin silver prints, evoking a retro quality that transports us back in time yet has resonance today. They document historical events as well as the marginalized societies and slices of life that Lyon so stridently captured. Included are several prints from Lyon’s book “The Bikeriders” (1968), an outcome of his joining the motorcycle gang the Chicago Outlaws for a few years. The photos are disarming and overflow with details: the dangling cigarettes, the hairstyles, the clothing, the leather-jacketed backs of riders as they hit the open road. Grouped in another part of the gallery are prints from Lyon’s years photographing the Civil Rights movement. Lyon gained incredible access to protesters and leaders, and was witness to the everyday discrimination faced by African Americans. The third series is from the book “Conversations with the Dead” (1970), which broke ground in documenting prison life. Lyon had access to six Texas penitentiaries over 14 months, forming bonds with the prisoners and creating a holistic portrait. Lyon’s prowess combines composition, detail and emotional impact, all a direct reflection of his compassion and empathy. The effect is to enlarge our own sense of humanity as well.